What is the deal with toddlers learning to talk and a lot of what they say sounds like an expletive! I mentioned a couple of posts back about how Marshall says 'sit'! You can imagine what is sounds like...just add an 'h' in the appropriate place! The new alleged cuss word was introduced yesterday. It all started with the swing set! I had separated and marked the wood yesterday afternoon while Mike was at work and Marshall was taking a 3 hour power nap (God Bless the Power Nap). While I was out there, I had my ipod in its dock listening to some tunes but had turned it off before Mike got out there. So, here we are in the beginnings of swing set assembly and Marshall looks at me and says 'bullshi*t". I looked at Mike extremely alarmed. Me: Did he say what I think he said? Mike: Sounds to me like he said bullsh*t.
Me: Oh my gosh, I know we cuss sometimes but do we use that word a lot. Mike: I didn't think so. Keep in mind, the entire time this banter is taking place between Mike and I the word bullsh*t has been said at least 100 times by Marshall. Think Rainman on one of his ramblings. However, we were so busy listening to Marshall's auditory cues that we were not paying attention to his visual cues. The entire time he is saying his 'word', he is pointing at my ipod dock. Come to find out he was saying 'music' not the previously stated expletive!! Boy were we relieved. I turned the ipod on and Marshall got his groove on and never said another word. He is the funniest little dancer. Whenever I feel like figuring it out...I will put a family dance night video on my post minus the adults! Now, let us turn 180 degrees and mention briefly, bubbles. I think it is hilarious how entertaining bubbles are to children. The ones you blow in the wind and the ones in the tub (not the man made kind!). I wish that was all it took to entertain me! 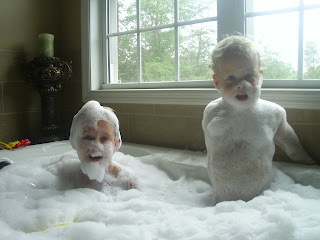 This afternoon I put both kids in the tub, filled it all the way up, added bubble gel, and turned on the jets. Instant entertainment for about 25 cents. For those of you that don't know...if you turn on whirlpool jets after you add bubbles it agitates it to such a level that you will actually have overflowing bubbles. The most fun ever for an 8 and 2 year old! Hopefully you can reclaim your youth just a bit as you gaze at my little guys having the 'cheapest time of their lives!' Everybody have a great work wee k!